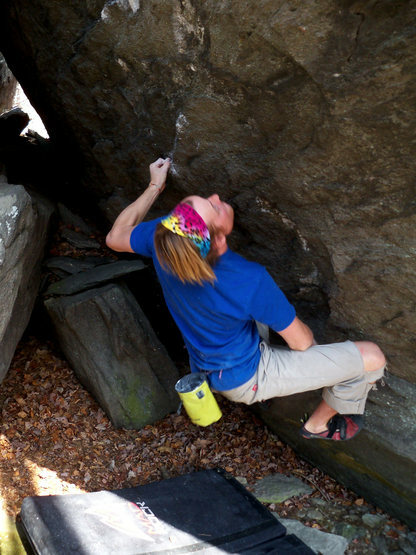 This weeks POW (Problem Of [the] Week) covers the short, steep, and sweet little problem known as “Billy Budd”, located in the Right Boneyard area of GHSP. Billy Budd has a nice landing below the face which is angled to a near 45, and on the steep “blade-like” boulder you will find the holds to be nearly all flakes, crimps, or crimp-flakes until you reach the nice, juggy, rounded lip for the top out. The problem sit-starts in the deep boulder-cave, to the far end of the face, low in the deep in-cut jug rail. Following the heel hook on the start, you traverse the upper crimp rail to the right with fun moves. 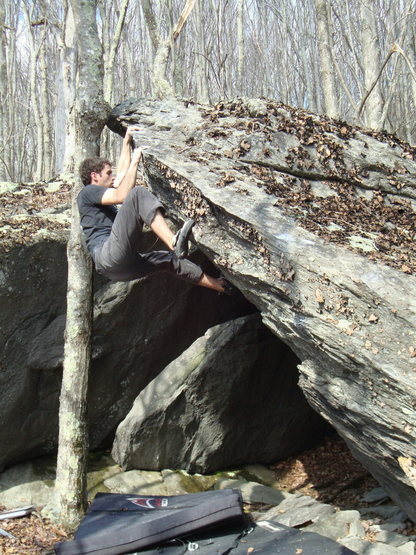 After a couple moves past varied holds to the right and under the close tree, you gain the boulders lip to top out easily. Billy Budd (V4) was named after Herman Melville’s book on Billy Budd the sailor. Most of the boulders is this little cluster were named, or have boulder problem names involving sea-going ships or people. Cannonade(V2), the River Boat Prow(V4/5), and Gunslinger(V7) are all fun and recommended in this cluster! Be sure to stop by!